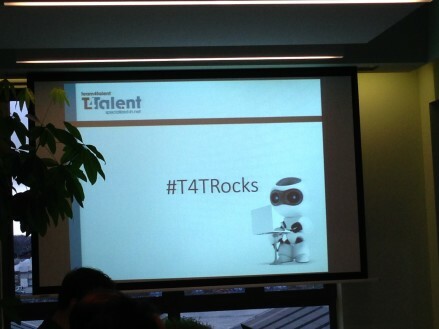 My company (Team4Talent) recently asked me to organize their next training day. I wanted all speakers to be colleagues. Everyone would feel more at ease and there would be more interaction. But there would also be no guarantee on the quality of the sessions. Speakers might panic, pass out or start rambling like a lunatic. But hey, better to try and fail than fail to try, right ? For those of you who are interested in my NodeJs presentation, the slides can be found here and the code can be found on my github page (here and here). Now, moving on to the reason I wrote this blog-post. I can honestly say that I was quite suprised by our speakers. The majority did not have any experience -or worse, had negative experience- with talking in front of a crowd. Some were confident while others were really nervous. But they all stood their ground, nobody ran :). Most noticable was that they all knew their topics inside and out. They really put a lot of effort into their sessions. 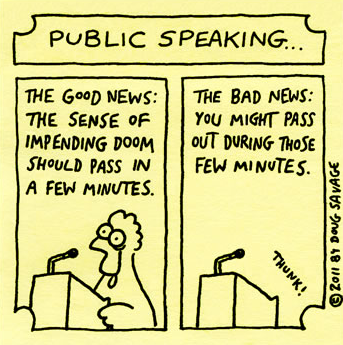 I believe this to be one of the biggest advantages of public speaking. You get the incentive to really explore and research a technical topic. to not simply create a hello-world-on-steroids-application, but really dig into why and how something works the way it does. I believe our speakers got a boost in self-confidence. They all seemed to be really excited to be able to stand in front of a crowd and present their topic. That's also the case for me, even more so when I finish a session. You'll always be nervous at first, and you'll always have way to much adrenaline running through your system. But you keep calm, finish the session and don't give in to that burning urge to panic and run away screaming.. It always feels like a personal victory, that feeling never fades. You don't even need to be an expert to talk about something in front of a live audience. But you do have to be passionate and excited about it. You have got to convince the people in front of you that your topic -and you as a speaker- are worth their time. So I guess, with this post, I would like to encourage developers to engage more in public speaking themselves. It might be frightening at first, but that's the case for all of us, and completely normal. For the record, all feedback I received preferred internal speakers over external ones. It was a real joy to watch my 'inexperienced' colleagues succeed so well in talking about topics they both love and know!